Based on the latest showings at Under-18 level, it looked like a strong line-up announced by Paul Tait. And they quickly surged into an impressive 2-goal lead after just 12 minutes with excellent goals for Michael Collins and Ellis Simms. More chances were created and could have been taken but the boys on blue looked to relax a little, letting Brighton come into it more but without threatening Harry Tryer in the Everton goal. The Blues defended well without really stepping it up in the second half, and will now face West Brom in the 6th Round. 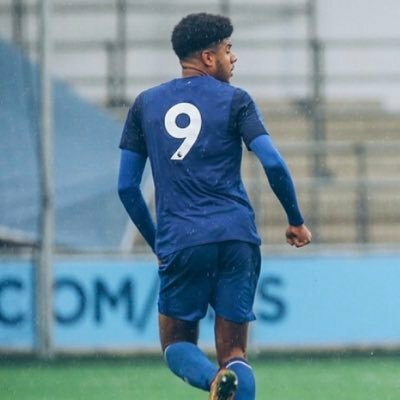 Everton U-18s: Tryer, Richards, Collins (90' Warren), Joe Anderson, Astley, Iversen, Adedoyin (70' Quirk), Carroll, Simms, Hunt, Gordon [Y:40'] (50' Hughes). Subs: Barrett, Dobbin. I almost hope Brighton score, just to see Tryer's angry reaction to the goalscorer if he makes the mistake of picking the ball out of Tryer's net. Michael, many thanks for this head's up. I will definitely be watching this game over lunch tomorrow (my time)! Hey, is our U-18 manager the same Paul Tait who used to play for Birmingham and once unveiled an obscene T-shirt directed at Villa? I played 15 seasons with a guy who had been a Birmingham hooligan in his youth (he had the knife scars on his belly to prove it), and he spoke of Tait with something approaching idol worship. I hope to make it. I've had a rough night, got a heavy cold coming on. These Monday nights will be the end of me, having to listen to red shites talking nonsense. To those who make it to the game, look out for little Bobby Carroll, a young inside forward who works his socks off and makes a lot of things happen going forward, Anthony Gordon, already mentioned, he's got bags of skill but floats in and out of the game. Simms is a great goalscorer but could get involved more than he does. I would love to see them get through to the final of this competition and give us something to cheer about and eventually win the FA Youth Cup. Wikipedia (if you can trust it) lists two under "Paul Tait, footballer". Paul Tait the Older (b 1971) seems to fit the profile you describe, with link! However, it's the Everton connections listed under Paul Tait the Younger (b 1974) that suggest to me he is the one in play here. Enjoy the game. We have at least 12 inches of snow now up here in Seattle and most everyone is hunkered down at home. Ah, OK, Michael, that makes sense. Didn't know there were two. I've been watching your snowstorm online. 500 miles south of you, we got some spectacular hail but only a light layer of snow. Dave, hope you feel better. Try some chicken soup. Florida, right. Where you get wonderful visitors like Betsy, Elena, Andrew, Charley, Ivan, Wilma, Irma, and Michael. Florida. Where the first words that school children learn are “inundated” and “evacuated”. Never let a natural disaster get in the way of paradise, Mike. My good friend played in this exact competition in the final. Later went on to play at Hofstra University here in the USA. It's a memory of his he clearly cherishes, despite not quite being able to make the jump to the first team. These kids are living a dream. I'll tune in a bit to watch if possible. It's always cool watching the kids play. Michael, it's definitely the younger Tait. If you don't want to take my word for it, the read an article on him in the Echo which confirms his career path. Tait is a mate of Unsworth. Just loving the banter between three of my USA based toffeemates. By the way, no snow, no wind and no cold here in the Lancashire Pennines, for the moment at least. Possibly jinxed myself with that last comment, hey ho. I really feel for you Northeners. I have been in Florida for 14 years and had all the names in the world through here but wouldn't swap it for those Northern chills anytime. However, now if you're talking about beer, that's a different matter. Jay and Jamie, I've lived in most regions of the US, and the Northwest coast is my version of paradise. No sweltering heat, no bitter cold, no blizzards or hurricanes or tornadoes. Where I live at the beach it's never colder than 30 or hotter than 80. And I like the rain. But to each his own, right? Steve, thanks for the detective work on Tait. Looking forward to the game. If there's no Forum let's all meet here and watch it together. I'd say that is pretty much his strongest team!! Interesting technique used by the Everton goalie in the penalty shootout in the last round. He stands a foot of two behind the goal line and moves forward as the kicker runs up, but by the time the kicker reaches the ball the goalie is clearly forward of the goal line. I still assume, that even during a penalty shootout, the goalie cannot leave his goal line? If not then a lot of those penalties could or should have been retaken. Maybe our expert ref, Mike Gaynes can explain? 5, 7, 9 and 11 are the ones we need to keep eyes on. These four are the ones most likely to make the first team. Astley I've not seen a lot of. 7 looks great, but is it he's just more physically developed? Simms is the same as 7, only more so. I really do wonder how he'd do if he played in a men's game. I saw one for the U23s and he was not good. Gordon, the ginger Messi, big things expected but he struggled after his injury last season. He's more erratic this season. Time for him to find some consistency. Thats correct Rob, hes trying to argue he was behind the line and charged out when it was taken. Rob as one of the all time great goalkeepers of amateur football in Liverpool you know your stuff !! Ah, come on Steve, everyone knows Percy was the best!! One for the Irish Blues to enjoy: Michael Collins! What a great goal by Ellis Simms. And as quick as yer like, 2-0 with an even better goal from Ellis Simms. Stonker! Two spectacular finishes 90 seconds apart. And I am very impressed by Collins and Anderson. Some great talent on display. Jay Wood, what has the news coverage been of the Flamengo tragedy? Rob #15, you are correct, what you describe would be a violation and the kick should be retaken. Horrible, Mike @ 24, horrible. A typical Brazilian tale of negligence and ignoring basic safety legislation. I'll tell more at half-time. Probably not reported much, but there was ANOTHER fire at a different academy just yesterday, 3 days later, with more kids hospitalized. Seems like non-contact. Seems like Ref is blowing up for every coming-together? Hadn't heard about the second fire, Jay. Not a bad performance but have you ever seen a team so casual in their passing and so timid in their tackling and giving stupid fouls away by the minute, do they remind you of another team with similar traits? Yes,, I thought so. Come on, lads, go for their throats in the second half and put the game to bed. Excellent showing so far. I'm most impressed by a player whose name I had never heard, Collins. He shows pace, power and presence, and the finish was superb. Richards also a pleasant surprise. Simms certainly showed his explosiveness and finishing power on the goal, and I like the way he works defensively. Gordon is clearly the best player on the pitch, but he knows it a bit too much. When he gets the ball in the attacking end, all good things happen. But the fancy backheels in his own half of the pitch have to go away. They don't look timid to me, Jay. They look like teenagers. Which, you're right, does remind me of the first team. Mackenzie Hunt at Number 10 is worth watching. I think he's been injured; he's well thought of within the club. Sorry I was replying to Dave, not Jay. Simms is exciting to watch, isn't he? Who else is enjoying our mixed and very dangerous corner routines? The first team could learn a thing or two from them. The performance a bit like the home tie against Sunderland. Total dominance, two goals to the good and then got a bit sloppy and lazy, allowing the opposition back into it. Need to raise the intensity again after the break. It's not difficult to follow and understand some of the images. Basically, they were housed in portacabins in a space allocated and registered as 'parking space'. Various experts in the piece describe these portacabins should only be used as temporary storage, or office space, certainly not as sleeping quarters. The portacabin was partitioned to create multiple rooms, with 4-6 youngsters in each 'room' in bunk beds. The fire started with a faulty air conditioning, with poor wiring and not properly fitted, held in place with bits of material and wood. The material which makes a 'sandwich' of the metallic interior and exterior walls is anti-inflammatory, but highly toxic. This explains why you can see healthy young man seemingly casually WALKING from the fire, rather than running: they are basically disorientated from a rude awakening at 5.00am in the morning as well as suffering smoke inhalation. There is one harrowing recording of one of the survivors saying how he was shouting to his colleagues to wake up and get up, but they didn't respond as they were already unconscious from the fumes. Another harrowing story is of players trying to escape via barred windows (virtually EVERY house in Brazil has barred doors and windows because of the crime levels). There was ONE single exit door and that was cut off to them. Imagine their desperation that they were able to bend the bars enough to escape. Flamengo is the most popular team in the whole of Brazil. They have a following of 30 million plus - half the population of the UK. Politicians, police, the fire brigade have turned a blind eye to many safety infringements rather than incur the wrath of the 'Flamengo electorate' at the polling booth, or the violence of the ultras. Yesterday 5 of the boys were buried. They interviewed one father, a Flamengo supporter from northern Brazil, who ever so proudly just 8 days before the tragedy accompanied his ONLY child to the local airport to see him off in pursuit of their shared dream. Yesterday, he returned to the airport to collect his son in a coffin to bury him. Horrible. Just horrible, the whole sorry tale. Is it just me or is there no sound? Just you, Geoff. We're hearing it. That's a horror, Jay. Can't imagine. And I read reports that Flamengo had just spent millions on a massive upgrade of the facility. Obviously they didn't spend it on housing for these kids. Sickening lack of regard for young lives. And to think the likes of Zico, Gerson, Ronaldinho and Julio Cesar came out of those rooms. They were more fortunate than they knew. It brings into focus the ridiculous millions that are paid to certain footballers every week when such poverty prevails in the world. Very impressed by the back 4 especially Ryan Astley and up front I thought Ellis Simms was outstanding. He didn't waste a single ball that came his way and certainly knows where the net is. Yes Mike, Flamengo have spent millions on improvements at the training camp. This is all part of the sorry tale. The new buildings were inspected by the fire service and they made recommendations of what needed to be improved, including having a water supply nearby for the fire service to use in the event of a fire. The portacabins were in use at the time of these inspections, in full view alongside the new buildings, but absolutely no reference is made to them in the fire service report. It is as if they were invisible. The site map the fire service reference in their report shows where the portacabins were located as 'empty parking space'. You have Rio's mayor claiming the club were warned 30 times to close the portacabins as accommodation. And you have the club CEO blaming a powerful storm on the day of the fire which caused power failures and peaks when the power came back on, totally ignoring the poor installation of said a/c that caused the fire, the lack of an alarm system, no fire exits, no supervision of the boys and nothing to extinguish the fire with. As I said earlier, it's a very Brazilian tale of power, influence, corruption, poor infrastructure, an absence of proper checks and control, a tendency to 'patch up and make do' and a total disregard for the welfare of others. The victims were children, entrusted by their parents to the care of adults. Just to highlight what you say about the money awash in football and poverty, Vinicius Junior who is starting to rip it up at Real Madrid is a 'fledgling' of Flamengo's 'ninho de urubu' academy and training camp - 'the vulture's nest' (long and interesting story why 'vulture'). Like many young hopeful Brazilians scouted and housed in football academies, he comes from a very poor background. He himself lodged in these portacabins. Aged barely 17-years-old, RM struck a €42 million deal with Flamengo for Vinicius. He has posted about his sadness on social medium and his RM manager spoke of how deeply affected the player was as the tragedy happened at his 'home' of many years, and that he knew many of the dead. It's trite to put a value on human life in these circumstances, but how many potential millions have Flamengo lost in the fire because they didn't take the minimum of required care to protect their 'investment'? It is truly sickening Jay. And worst of all, just like with Brumandinho, none of the real culprits - the chief execs, mayors, governadores - will be remotely punished for their negligence which, if they were from less powerful institutions, would result in convictions for culpable homocide. Heck, they won't even get suspended from their positions. When watching the news, all I could remember was the president of Flamengo at the press conference of the unveiling of 'Gabigol'. How he was talking about how the huge amount of money being spent to guarantee the loan fee and wages of their summer spree was all 'guaranteed' and 'within their budget'. Spending money at will with one hand, and murdering 10 young boys by refusing basic investment in infrastructure with the other. I went with my 7-year-old nephew to the game tonight which we won 2-0 to have a look at the youth game. What can I say, they look so much more composed than the 1st team, lots of small accurate triangles that actually worked, there was very little trying to thread the eye of needle, if there was a shot on, they shot, if the ball needed clearing they hoofed it, tactics and formation were good. There was only a few hundred at most in the Upper Bullens, about 20 lads in the Park End who sang their hearts out (well done! ), 30 or so in the Club 500, so I could hear clearly the communication between them that led to excellent positioning, movement and teamwork. All the basics were done and done so well, unlike the first team. I'm not in the least bit surprised they're top of their league, they have such a relaxed effortless style, the only thing they really lack are what will come with age, size, strength and pace over the next few years. If they had these attributes now I'd bin the first team and play these boys, there's so much more passion in them, they're as honest as the day is long, not earning whopper salaries, but just trying to make it a game and giving everything unlike the white flag types we've got now. This is the best U18 team we've had in years. Although the Davies, Dowell, Walsh, and Connolly side had more players playing up a level, these guys are more of a team and four 1st years on the pitch at the end. Astley, Hunt and Carroll have been getting better all season, and Astley is the best young defender we've had come through for ages. It was nice to see Collins and Richards coming back after long injuries. Some tough decisions ahead as to who gets contracts in the next few months. I was disappointed with Adeydoyin; last season, he was way ahead of Simms with his skills... but he's gone backwards if anything this season. Talking to a blue in the Bullens and we agreed — 75% of these lads will be passed over by 20 for foreign players. Adeydoyin, the bigger physical ones can rely on this attribute too much, whereas the smaller players are forced to become skillful. Couldn't watch the game, but just went to YouTube to check out the goals. The second by Sims I loved. Wins the ball, cuts in, terrible angle, and what else would a true striker do? Top shelf. Great goal, love the instincts to just shoot the damn thing. Cracking through the YouTube feed in spurts, that kid looked like a real prospect to me. Big, strong, quick, eye for goal. Think we should be watching his progress. Astley was dominant tonight. He's fearless, charging shots down, making clearing headers, cool in possession and always seems to be where he should be. John, yes, MotM for me... but I would say the same about Collins. Rob #44, according to Franny Jeffers those 20 lads singing in the stands had never met before – they're members of an online fan board and chose this occasion to get together for the first time. Jay and Fran, thanks for your additional information and perspective. In addition to the personal tragedies and the cold financial aspect of the loss, we'll never know what wondrous gifts have been lost to the world. There might have been another Ronaldinho or Zico in those beds. When you read about what happened in Brazil (twice now) it's hard to concentrate on the game itself, added to the agents involved in the lad's transfer to Cardiff City and the culture of building academies just to breed big deals, it's all about money, money and more money. However, nobody can take away the memories I've got through the years, when footballers played for the sheer joy of just playing. They'll never be equalled by todays, mostly, money-grabbing no-marks. We will be one of the favourites to win this cup now. We next face a West Brom (bottom of our U18 Premier League North Division) who knocked out a good Arsenal team. The likes of Chelsea, Man Utd and Spurs are already out. The other well thought of teams are Man City and of course Liverpool. If we beat West Brom, it will be Man City or Bournemouth in the semi. Then maybe the RS waiting in the final! That could make an interesting match! West Brom could be tough. They beat a very good Arsenal side who on paper were probably favourites for this cup. I remember we dropped our first league points of the season to them in a 3-3 draw, I think we may have been 3-0 down at one stage. Then we thumped them 10-0 in another cup. I would guess that they've got a number of good U18s who may play up a level at times, hence their inconsistent results. That's a good point Phill, it's difficult to know how many good players clubs have appearing for the U23s who can drop down for the U18 cup games. Though perhaps pulling such individuals in can disrupt the team rythm? I think our team last night was pretty much the same lot that has played in all the league games. The likes of Simms, Gordon and Astley have featured occasionally for the U23s but played most of the U18s league games too. Fran @ 42 (and apologies to others for expanding on the Flamengo fire tragedy, but it is symptomatic of Brazil and touches a raw nerve for those of us who live here). As you say Fran, none of the real culprits are ever punished for these tragedies in Brazil. Brumandinho to Mariana, where a similar dam burst tragedy occurred 3 years ago, is just 50 miles, 80 kms. Same state. Same company Vale, the biggest producer of iron ore in the WORLD earning BILLIONS every year. Exactly the same disaster. Same cover-up and blame shifting being acted out. Three years on from when a tsunami of 40 millions litres of highly toxic waste was released into the Rio Doce (oh, the irony...'Sweet River'), flowing 650 kms from the interior into the Atlantic Ocean, destroying many riverine communities and sea fishermen's livelihoods off the coast - marginalised and poverty-stricken communities, dependent on fishing for subsistence living - NOBODY has been prosecuted. 650 kms... that is the equivalent of both the River Thames and the River Severn being polluted along their whole lengths and disgorging the waste for years off both the English and Welsh coastlines. What political, social and environmental uproar would result if that ever occurred? Yet in Brazil, those who took the brunt of the dam burst of 3 years ago have yet to be permanently re-housed, yet to receive financial compensation, and their environment has yet to be cleansed. It is calculated 1 million people have had their livelihoods, clean water supply, fishing and agriculture, tourism and even energy supply (hydro-electric dams shut down for fear of what the corrosive toxic waters could do to their generators) seriously undermined by this disaster. All this while the Company responsible (and both Australia and the UK are implicated as the mining giant BHP Billiton is a partner of Vale) continue to tie up numerous processes in the court and refuse to pay all the fines imposed on them. Back to the football, as you say Fran, the president of Flamengo was happy to front the cameras a few weeks ago as they laid out big money in 2-3 signings. He has avoided the cameras this past week and put up his CEO, who point-blankly refused to take or answer questions on the tragedy, other than to say: "Everything was correct. Everything was in order. We were proud of the installation." Yes...following the fire in which 10 young lives were lost, the club CEO said he was 'proud' of the installation where they were housed. And you can bet your last Real that if and when anyone is ever prosecuted for this, it won't be any high-ranking official, but some underling thrown under the bus. Goodison hasn't heard or seen enthusiasm like what those lads showed since Howard Kendall's glory period, they didn't sit down all night and made a stadium-filling noise. Wow! They've only just met each other, they're something to be proud of. Pardon for going off topic but Holgate is up against Dowell shortly, should be interesting. Dowell is playing in the Number 8 role just behind the strikers and, as Gerry above says, scored after 14 minutes.